The aim of HEREiAM is to help older adults to stay longer and independent at home by providing an innovative user-friendly technology able to support them during daily life activities. Our solution can be conceived as an integrated, smart platform which will allow elders to have access to a set of services directly from their TV set at home. 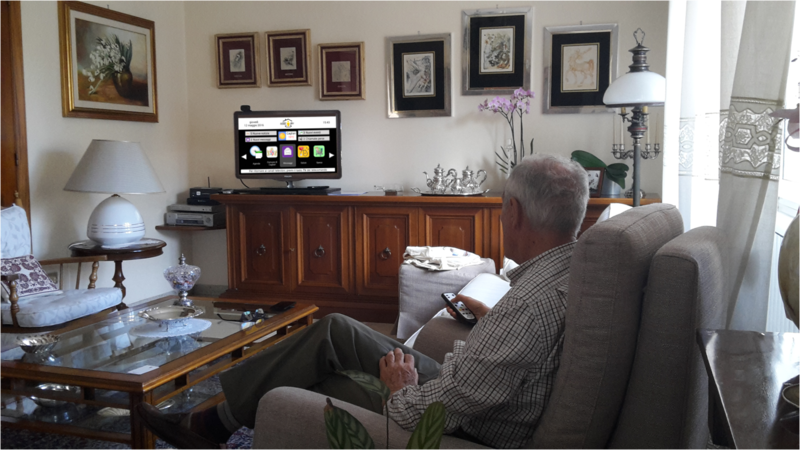 The TV is present in our homes since more than 50 years and it is now part of our daily life in particular for older people that already spend much time in watching dedicated programs. Everybody can use a remote control without being afraid of making a mistake in the performance of very basic interactive functions. Therefore, a TV-based platform is a good solution to overcome the older adults traditional digital divide to use ICT systems. The HEREiAM system is designed for a specific target group of self-sufficient elderly people who want to be independent as long as possible in the management of personal and social tasks. The services provided by HEREiAM will meet needs expressed by households, giving them a sense of security, belonging and well-being at home.